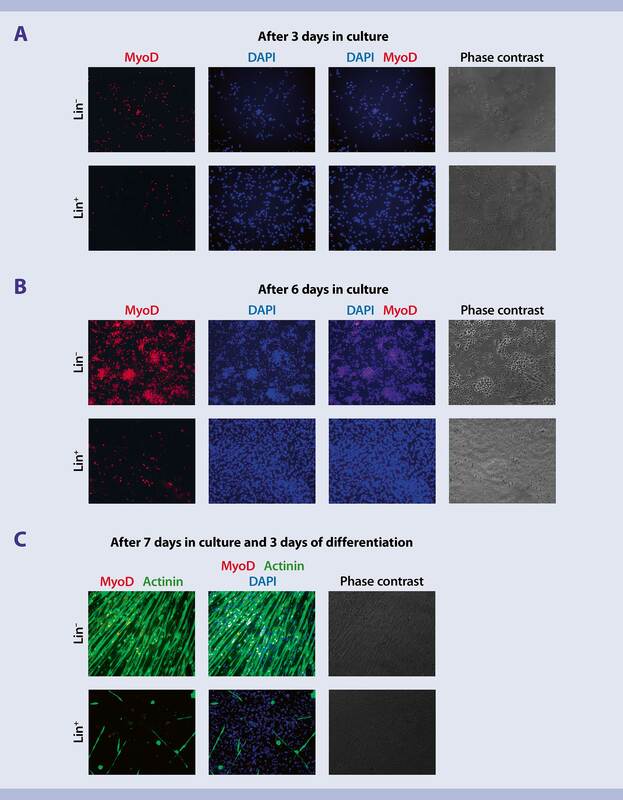 In this application protocol, we describe an easy and fast method for the dissociation of skeletal muscle tissue from mouse and a subsequent isolation method that generates a highly pure population of satellite cells and minimizes bias in downstream applications caused by contamination with non-target cells. PBE buffer: Prepare a solution containing phosphate-buffered saline (PBS), pH 7.2, 0.5% bovine serum albumin (BSA), and 2 mM EDTA by diluting MACS® BSA Stock Solution (# 130‑091‑376) 1:20 with autoMACS® Rinsing Solution (# 130‑091‑222). Keep buffer cold (2−8 °C). Always use freshly prepared buffer. Do not use autoMACS Running Buffer or MACSQuant® Running Buffer as they contain a small amount of sodium azide that could affect the results. (Optional) Anti-Integrin α-7 MicroBeads, mouse (# 130-104-261) to further increase the purity of isolated satellite cells, e.g., for direct molecular analysis, such as mRNA expression profiling. MACS Columns and MACS Separators: For optimal purity and recovery use an LS Column. Depletion can also be performed using the autoMACS Pro Separator. The following instructions generate a high-purity subfraction of functional and culturable satellite cells. Use the Skeletal Muscle Dissociation Kit to generate a single-cell suspension by combining mechanical dissociation with the gentleMACS™ Dissociator and enzymatic degradation of the extracellular matrix that maintains the structural integrity of the tissue. Follow the protocol of the kit data sheet. Dissociation of solid skeletal muscle tissue generates single-cell suspensions with high viability. The Skeletal Muscle Dissociation Kit combines enzymatic and mechanical treatment with the gentleMACS Dissociator to generate a single-cell suspension with low amounts of debris (left) and cell viabilities above 90% (right). The Skeletal Muscle Dissociation Kit combines enzymatic and mechanical treatment with the gentleMACS Dissociator to generate a single-cell suspension with low amounts of debris (left) and cell viabilities above 90% (right). Isolate functional satellite cells by depleting non-target cells with the Satellite Cell Isolation Kit. The kit contains a cocktail of monoclonal antibodies conjugated with MACS® MicroBeads the magnetically label non-target cells. These are retained within the MACS Column, while the unlabeled satellite cells pass through during elution. Follow the protocol of the kit data sheet. Depletion of non-target cells from a single-cell suspension of skeletal muscle tissue generates a high-purity subfraction of satellite cells. Cells expressing lineage markers (CD31, CD45, CD11b, Sca-1) were depleted from dissociated skeletal muscle tissue of mouse, leaving functional satellite cells that can be optionally purified further with a positive selection step based on integrin-alpha-7 expression. Cells expressing lineage markers (CD31, CD45, CD11b, Sca-1) were depleted from dissociated skeletal muscle tissue of mouse, leaving functional satellite cells that can be optionally purified further with a positive selection step based on integrin-alpha-7 expression. Characterization of isolated satellite cells. A and B: Isolated satellite cells give rise to myoblast cultures without pre-plating or selection media. C: Efficient in vitro expansion and differentiation into myotubes. Satellite cells isolated with the Satellite Cell Isolation Kit, mouse can be plated and give rise to homogenous myoblast cultures, without the need for pre-plating steps or selection media to deplete fibroblasts. Kuhl, J. et al. (2014) Isolation of functional satellite cells using automated tissue dissociation and magnetic cell separation.